Perfect place! One of the best hostels I have ever stayed at. The location and attention to detail here was great. Made lots of new friends. I loved my stay at Palmar - it’s such a beautiful place where the stunning jungle meets the ocean. 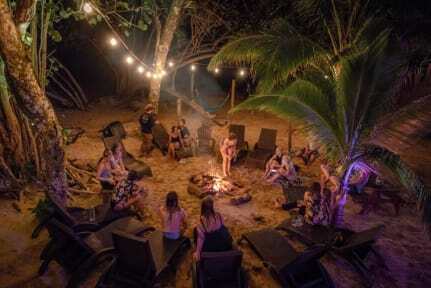 It’s a place where you can relax in a hammock with a good book, do yoga, go for a long walk on the beach or have a good time with other travelers in front of the bonfire in the night. The place is clean, the staff has a good energy and it’s also a perfect place to do small trips to Bocas or other islands. :-) Go there, you will not regret it!! Amazing stay at Palmar! Red frog beach is beautiful and Palmar offers a fun and clean stay right in the beach. Dorms were comfortable and rustic with plugs and fans at each bed. The bar offered cool senate vibes, great food and live entertainment one of the nights we were there. The staff were helpful and friendly. Rented snorkel gear to go to polo beach and well worth the walk over. Regular shuttles to bocas town as well. Hope to go back again and can’t recommend enough. Thank you for the stay! Great place on the beach. Good vibes, food and staff. My stay here was so amazing! Plenty of spaces to chill, a beautiful beach, attentive and friendly employees and great accommodations. I stayed in a glamping tent and was super comfortable. The set up of the tent was beautiful as well and the private patio around the tent was a great feature. The food was affordable and delicious and the menu catered to people looking for a varying range of prices. Thanks sooo much Palmar! Palmer Lodge is one of the best hostels I've ever stayed at. 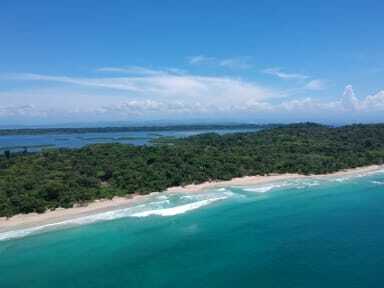 The location is perfect- right on Red Frog beach in a beautiful jungle setting. The atmosphere is very laid back, but still social for a solo traveler. I really like this hostel because you get the feeling of a remote location without actually being isolated like at Bambuda Lodge. There are tons of activities and exploring to do around the island. The free shuttle service from Isla Colon was a nice touch. I will be back soon! This is the best hostel we stayed at during our time in Panama. The location is stunning. The commitment to sustainability commendable. The food at the restaurant was very good, but limited by availability. My only complaint is with the smokers who think it’s fine to light up wherever they like. I guess if you have no respect for your body, you will not have any for others either. Bastimentos is by far the best place we saw in the Bocas area. We wished that we had spent more time here. As a couple traveling in our 30’s, we thoroughly enjoyed our 3 nights at Palmar! We found that the glamping tents were surprisingly comfortable and spacious. The entire vibe of the eco-resort is spot on, and we were fortunate enough to see a sloth climb through the main restaurant at dinner! We would happily stay here again and the trek to Polo Beach is HIGHLY recommended. Amazingly beautiful location but far from town and other activities. Food is really good. Service is slow and not particularly friendly or attentive. The staff are great. Right on the beach which is great. Quite coupley for a single traveller but a great place to chill out for a couple days.